Here’s the thing. About half of the business in Las Vegas is from people driving in from Southern California, and when gas prices shot way up many of those people decided this was an expense they could do without. And airfares also shot up for the same reason, so there are thousands of empty hotel rooms in Las Vegas every day lately, and they have to slash prices in order to fill some of them up. 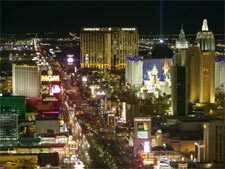 It used to be that you’d have to pay $150 per night at a minimum for a hotel on the Strip, but now you can stay a whole weekend for that amount if you look around. These deals through Travelocity include some tempting extras, like free nights on top of already good prices. If you are thinking about a Las Vegas trip, take advantage of their current hardship with a great deal, and then make a killing at keno or the big six wheel once you arrive.